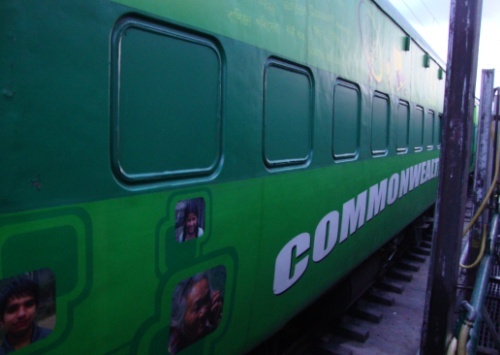 Captured on August 16, 2010, the Commonwealth Express (CWG) train which was flagged off from Delhi June 24 stands at the Secunderabad Railway Station. The train aims at spreading the spirit of the Games and motivates youth across the country to participate in various sports. The exhibition train comprises 11 coaches. While five coaches feature rare CWG memorabilia, the remaining six are devoted to showcasing Information and Communication Technology (ICT). Secunderabad, which is the twin city of Hyderabad, is the 26th stop-over for the train, During its 101-day journey, the special train will travel through 21 states and three union territories, stopping at 49 major stations before returning to Delhi on October 2, well on time before the scheduled start off date of October 3, 2010.